We are hardly prepared for the avalanche of new activities we have to engage in when starting an online business. Not only do we have to create and photograph fabulous handmade items, to list them in a virtual marketplace but we also have to play the role of our very own marketing manager. 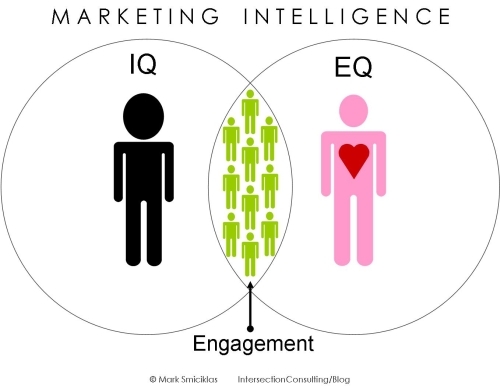 Is marketing EQ becoming more important than IQ? If building a successful brand or simply selling your “stuff” depends on creating an emotional connection with your target audience, is emotional intelligence as a marketer becoming as important as the ability to implement marketing tactics? Graphics by Intersection Consulting. In this context, marketing reminds me the cherry on top of the cake. It is the extra added bonus to every creative person's efforts out there. A bonus which comes on top of everything (and a bit more) we thought we were supposed to do. But, like it or not, we cannot deal without it. Even the most amazing work of art cannot be sold without getting seen and to get our works ween, we need to promote them. Do you have any other tips that you can add to this list? Those are great tips! Another important one to remember is to keep variety on your blog and Twitter account. Only talking about your shop or product will turn people off. Thank you for sharing the tips on marketing! Very helpful!